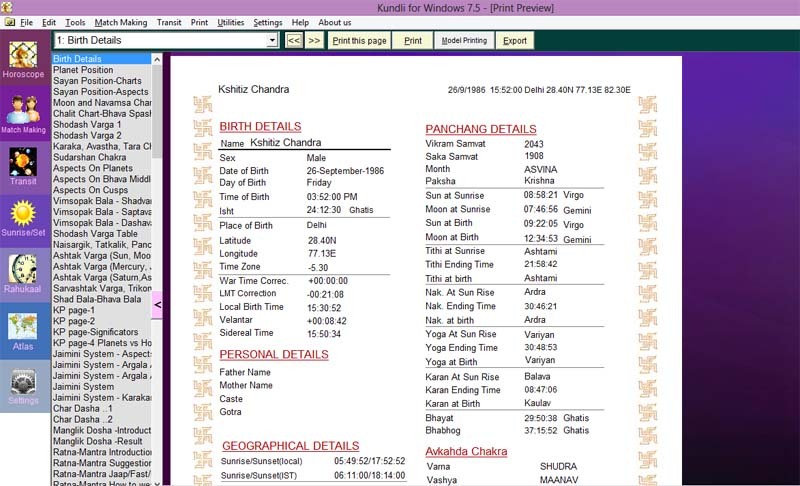 Introduction What is Kundli Pro for Windows? Astrology is a science and not fiction. And, since it is based on facts and lengthy calculations, application of computers can surely help to use this treasure ancient of Indian culture. Astrology is based on the fact that the environment affects our life. This can be seen in the way in which the Moon makes the oceans rise and fall. Similarly, other planets also influence all non-living and living forms including human beings. Accordingly, it is up to us as to how we study and predict the changes that they bring in our lives. Obviously, improvisation in calculations leads to perfection in the predictions. Various methodologies and beliefs exist about the systems for making predictions. However, the system of calculations remains the same except for some bases such as Sayana system and Nirayana system of planetary positions, differences in Ayanamsa calculation etc. 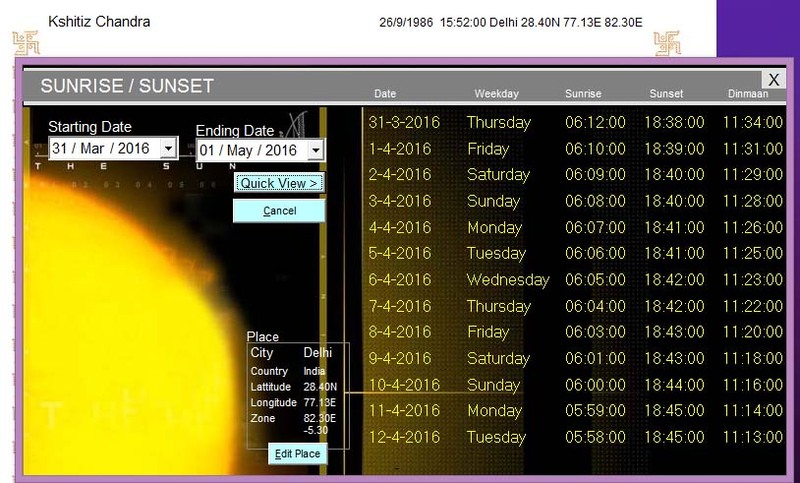 To accommodate these changes, we have included the option of common Ayanamsa Calculation methods and both Sayana and Niryana longitudes. Evidently, human are more prone to commit errors. 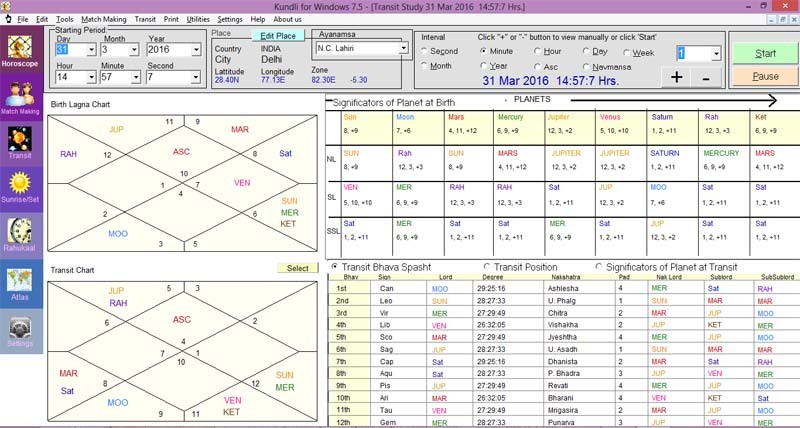 Therefore, we have combined the power of the computer and ancient astrological know-how to produce a much more accurate system of horoscope casting. As is well known, for making predictions, there is a lot of variations in the beliefs and systems being followed. While the Western approach is based on the Sun, the ancient Indian approach is based on the Moon.. It is simply because changes in the Moon's positions are very fast and they affect our life equally fast. Based on this method, we have included a general prediction system along with the Varshphal for making predictions as one goes along. Better Design and easy to use. 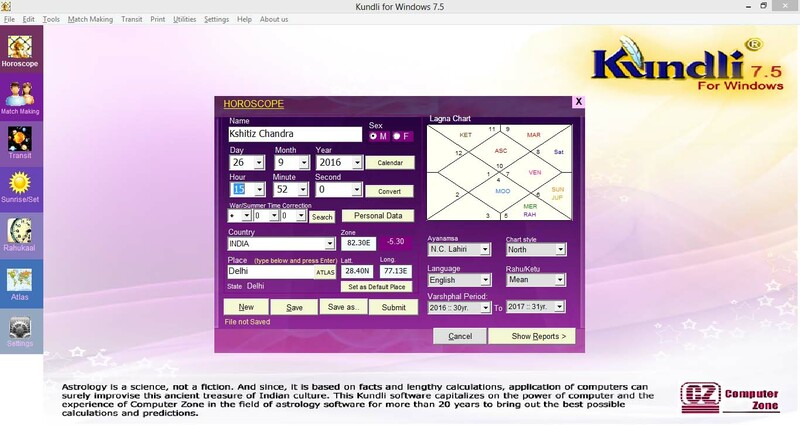 Kundli for windows is the vedic indian astrology software by Computer Zone. 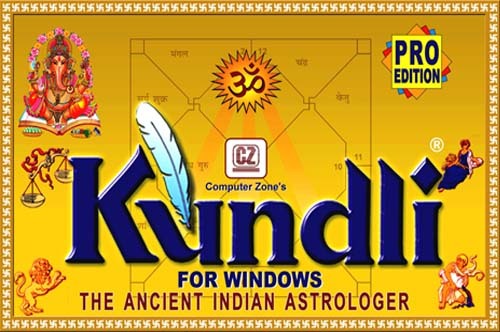 Kundli for Windows and all new upcoming versions are developed for Computer Zone by the leader in Astrology software development & Astro Research - Horizon aarc. Horizon aarc is a team of experts dedicated to Astrology research for last 14 years, under the expert guidance & research of Acharyasree Pawan Chandra and Developer Kshitiz Chandra. 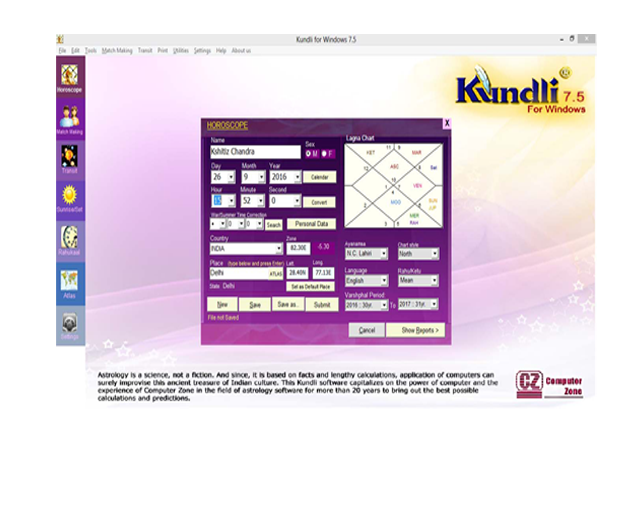 Kundli for Windows, a project started by Mr. Kamall Dev, popularly known as Kundli software, is a worldwide popular Indian Vedic Astrology software. 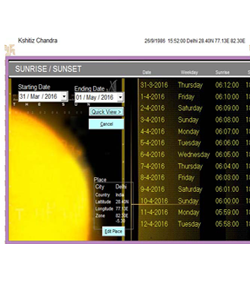 Kundli for windows is famous for its eye catching interface, easy to operate, precise calculation and accurate predictions. 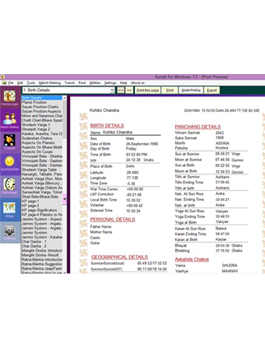 Kundli for Windows now offers, better results, more reports, easy to use interface and compatibility with latest Windows 8.0, Windows 8.1 and 10 (32 & 64 bit) For more details and latest updations, feel free to contact us..